Rajasthan suffered the ignominy of being bowled out for a paltry 35 against Railways in a Central Zone leg match of the Vijay Hazare Trophy, in Nagpur, on Tuesday. Railways needed just 5.3 overs, losing a solitary wicket, to hit up the required runs. The match, at the old Vidarbha Cricket Association ground at the Civil Lines, lasted just 21 overs. This is the second lowest score by a team in the history of India's domestic one-day competition. The lowest score in List ‘A’ in India is Saurashtra's 34 against Mumbai, back in 2000. Across the globe, it is the seventh lowest total in first-class cricket. Rajasthan skipper Pankaj Singh opted to bat first, but his players lacked the stomach for fight. As many as five batsmen were out without scoring. Railways seamers Anureet Singh (5-16 in 8 overs) and Amit Mishra (5-18 in 7.3 overs) shared the spoils. The highest scorer was Arjit Gupta. He scored 13, which incidentally was the only double digit score by a batsman. Asked about such dismal score, Railways skipper Mahesh Rawat was quick to point out that there were no demons in the pitch. "Yesterday we played at the same ground and both teams scored in the range of 240-plus. So you can't simply blame the pitch. The pitch was fine and there were no demons. Our opening bowlers were brilliant from the start. We have a young Bilaspur boy, Amit, who bowls out-swing at a decent pace and we had Anureet, who is a seasoned campaigner at this level," Rawat told PTI from Nagpur. "The areas that our new ball bowlers bowled were brilliant and it became difficult for their batsmen. They wilted under pressure created by out bowlers," he added. 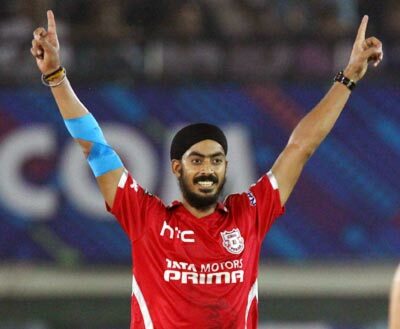 Rajasthan: 35 in 15.3 overs (Anureet Singh 5-16, Amit Mishra 5-18). Railways: 39-1 in 5.3 overs (Asad Pathan 20). Hyderabad: Karnataka dished out yet another commanding batting display to beat hosts Hyderabad by five wickets in a high-scoring South Zone leg match. Chasing a challenging 295 for seven, the top four Karnakata batsmen struck half quick centuries to seal the match with 12 balls to spare. Openers Mayank Agarwal (70 off 68) and Australia-bound K L Rahul (53 off 58) set the tone for the chase with a 112-run first-wicket stand that came off 18.4 overs. While Agarwal was the more aggressive among the duo, hitting nine fours and a six during his knock, Rahul played second fiddle, striking four boundaries and one hit over the fence. Soon after Rahul's dismissal in the 19th over, Agarwal followed 25 balls later at the team score of 127. But new batsmen Shishir Bhavane (81 not out off 76) and Manish Pandey (56) took it from when Agarwal and Rahul left and continued to bat freely to keep Karnataka in the hunt. Bhavane and Pandey stitched 93 runs for the third wicket off just 84 balls to take Karnataka closer. Earlier, Tanmay Agarwal smashed 136 off 123 balls, with the help of 13 fours and four sixes, while Hanuma Vihari made 82 off 101 deliveries during which he hit five boundaries and one six to help Hyderabad post 295 for seven. Ashish Reddy was the other Hyderabad batsman to have made a notable contribution with quickfire 51 off 35 balls. He used his long handle to great effect to hit five boundaries and one six. Pacer Arvind Sreenath shone with the ball for Karnataka, picking four wickets for 41 runs from his 10 overs. Hyderabad: 295 for 7 in 50 overs (Tanmay Agarwal 136, Hanuma Vihari 82, Ashish Reddy 51; Arvind Sreenath 4-41). Karnataka: 300 for five in 48 overs (Shishir Bhavane 81, Mayank Agarwal 70; Amol Shinde 2-52). Ahmedabad: Deepak Hooda and Yusuf Pathan smashed half-centuries to power Baroda to a comfortable seven-wicket victory over Maharashtra in a West Zone leg match in Ahmedabad. Hooda struck a run-a-ball 88 that included six boundaries and five sixes while Pathan scored an unbeaten 82 off 93 deliveries as the duo shared 104 runs for the third wicket to lay the foundation for Baroda's easy win. Earlier, opting to bat, Ankit Bawane hit an unbeaten 102 off 127 deliveries before Maharashtra were bowled out for 243. Bawne single-handedly took Maharashtra near the 250-mark, in the process hitting six fours and three hits over the fence. Apart from Bawne, skipper Rohit Motwani scored 40 off 55 balls, while opener Harshad Khadiwale scored 22 off 26 deliveries. For Baroda, Pathan (2-27), Hooda (2-42) and Krunal Pandya (2-57) shared six wickets between them. Later, chasing 244 for victory, Baroda did not have the best of starts as they lost opener Aditya Waghmode (6) in the third over. But Saurabh Wakaskar (42) and Hooda steadied Baroda's chase with a 64-run second wicket stand before Hooda combined with Pathan to assert their authority in the match. Hooda was unlucky to miss out a well-deserved ton as he fell 12 runs short of the three-figure mark, caught by Nikhil Naik off off-spinner Shamshuzama Mujtaba Kazi in the 32nd over. Pathan and Pandya ensured no further damage for Baroda as they added 67 unconquered runs for the fourth wicket to overwhelm the target in 45.5 overs. Maharashtra: 243 in 49.4 overs (Ankit Bawne 102, Rohit Motwani 40; Yusuf Pathan 2-27). Baroda: 244 for 3 in 45.5 overs (Deepak Hooda 88, Yusuf Pathan 82 not out; Nikhil Paradkar 1-35). Kalyani: Tripura saw four run-outs in their innings as the Yogesh Takawale-led side fell short by three runs in a low-scoring thriller against Odisha in an East Zone leg match. Needing a modest 196 for victory at the Bengal Cricket Academy Ground, Tripura made a mockery of their chase and were bundled out for 192 in 49 overs. Despite a calculated 43 by opener Udiyan Bose, Tripura not only lost wickets at regular intervals but the run-outs of Rakesh Solanki (22), Tushar Saha (0), Saurabh Das (4) and finally Rana Dutta (0) proved disastrous. Sanjay Majumdar also contributed with an unbeaten 33 and looked like taking Tripura to victory when last-man Dutta was run-out on the last ball of the 48th over. Odisha pace spearhead Basant Mohanty may not have contributed with wickets but was the reason behind three of the four run-outs. For Odisha, Anurag Sarangi, who top-scored with 68, was the man who set up the victory for the Biplab Samantray-led side. intervals and Sarangi's 77-ball stay, laced with nine fours and a six, got the team total to 195 all out in 49.3 overs. A fighting 31 by number-ten batsman Suryakant Pradhan also helped the Odihsa cause in a low-scoring match. Left-arm orthodox Saha was the destroyer-in-chief with three wickets as medium pacers Manisankar Murasingh and Sanjay Majumder and off-spinner Saurabh bagged two wickets each. Odisha are now second in the East Zone points table led by Bengal while Tripura lie at the bottom sans a win from three matches. Tripura: 192 in 49 overs (Udiyan Bose 43, Sanjay Majumdar 33 not out; Deepak Behera 2-21). Secunderabad: Robin D'Souza (3-36) and S S Bandekar (3-43) shared six wickets between them as Goa stunned Tamil Nadu, registering a six-wicket win in their South Zone leg match. After putting them in to bat, Goa bundled out Tamil Nadu for a meagre 182 in 49.2 overs and then chased down the target in just 33.2 overs, losing just four wickets. Goa medium pacers D'Souza and Bandekar wrecked havoc, while spinner Shadab Jakati (2-26) chipped in with two crucial wickets to unsettle the fancied Tamil Nadu batting line-up. The only batsman to make a significant contribution for Tamil Nadu was R Sathish, who scored a 75-ball 67, studded with five fours and a six. In reply, Goa got off to a solid start with openers Amogh Desai (68; 73b, 9X4) and Swapnil Asnodkar (77; 87b, 10X4, 2X6) putting on 146 runs together and almost sealing the match. Although, Goa lost four wickets in quick succession, they eventually they finished with 184 for four in the 34th over. Tamil Nadu: 182 in 49.2 overs (R Sathish 67, Dinesh Karthik 29; Robin D’Souza 3-36, S S Bandekar 3-43). Goa: 184 for 4 in 33.2 overs (Swapnil Asnodkar 77, Amogh Desai 68).